Technology evolves, and to survive as artists, so must we. One of the things I’ve struggled with for a long time – something I suspect most photographers struggle with – is coming up with a well-defined plan for success in the photo industry. In my case, specifically, the landscape/nature photography genre. There are so many angles that need to be considered… How does one define success? Is it simply being able to do what one loves? To some degree, I think the answer is yes. So, how do we break into either world? First, you absolutely need quality images. You need to educate yourself, practice your photo skills and be an editing champ. But that’s not enough, is it? The world is filled with many many many amazing photographers, and chances are, you’ve only heard of a fraction of them. Just like any other company or business, you need to market yourself. But then…is that enough? From my perspective…that of a female…seems like it might be. But then again, it might not be. Fstoppers put out a little editorial a few years back that broke down the disparity between salaries (men vs women), the numbers based on what type of photography your pursue, and the overall numbers of photographers by gender. According to FStoppers, as of the date of publication, yes…photography is still a man’s world (though the numbers of female photogs is growing). For the whole article and its references, go here. So, while I’ve always felt that landscapes tend to be a bit of a boys club, and sometimes struggle with how difficult it is to find a toe hold in the genre, the MOST interesting part of the whole read was the commentary at the end. One of the readers mentioned that men are more gadget and math brained, therefore more interested in the technicalities of photography versus “making pretty pictures”. This, as you can imagine, offended some of the ladies out there. Personally though, I took it as a challenge. 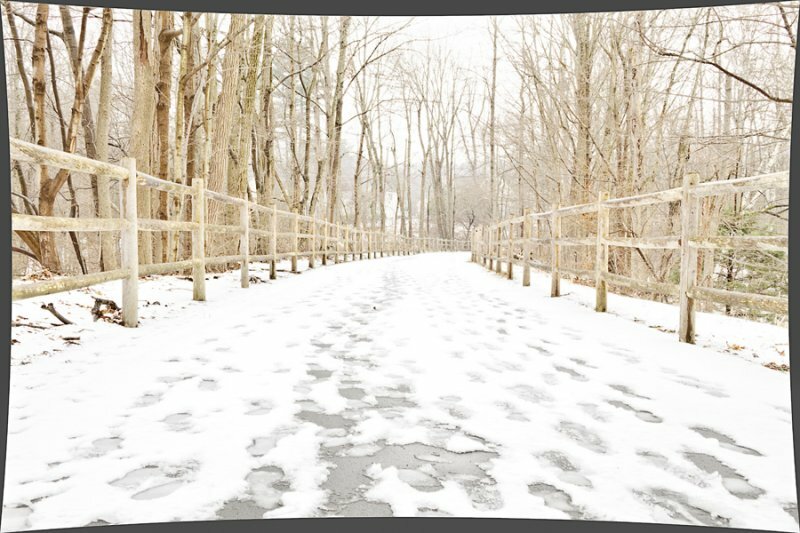 The finished edit (left) versus the RAW (right). This particular image was one of those that required a little more work than just your standard curves and levels. 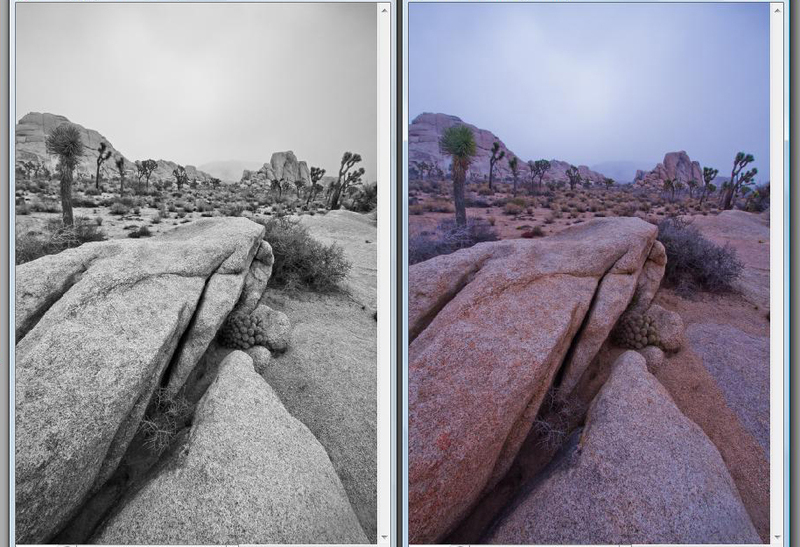 I took this bad-boy in Joshua Tree Nat’l Park in March, just as it was about to snow. YES! I said SNOW! 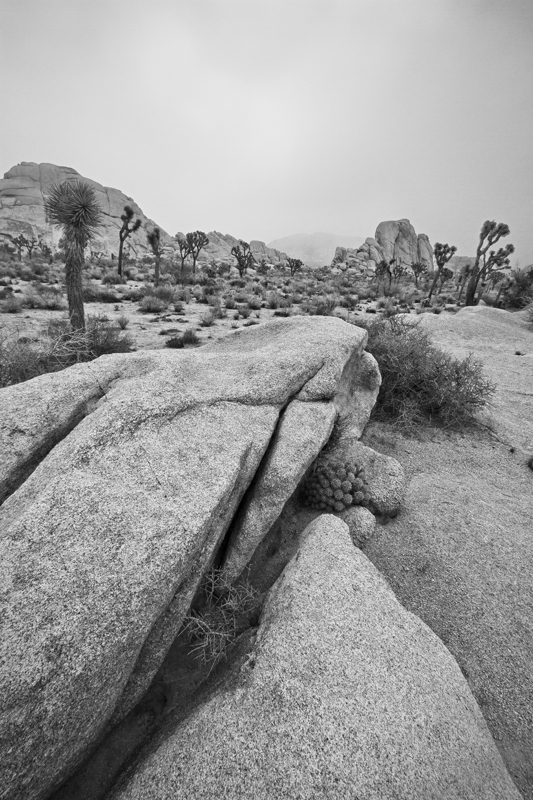 The sky was flat, so I took this image intending to change it to a black and white and rely on the texture of the rock and the interesting trees as points of interest. The problem I was running into was that I wanted to adjust just a particular tonal range to make the trees pop without laying on heavy contrast throughout the whole image. Now, there are a lot of time consuming, inaccurate ways to go about this that require a lot of work. Or, there are luminosity masks, a super genius invention. While I have used them before, I was not proficient in them. I took my FStopper’s go-get-em attitude and applied it to practicing and playing with this image. In the end, while I still don’t love the flat sky, I’m much happier with the tonal adjustments throughout the image and feel much more confident using luminosity masks. It’s Not You, It’s Me Blog-land! Also on the calendar…today is New Haven, CT’s Help-Portrait event (I’m literally packing my camera and my typing at the same time…impressed?). I’m super excited to get my good karma on today and help build some self-esteem and good memories in my community. But…can’t share those photos either! After this weekend, I’m scheduled to have a minor hand surgery (wish me luck, mmmkay? I’m gonna need my fingers later to press the shutter button. haha) I’m hoping that, while recovering, I will be able to (slowly, with one hand) post our street gallery from my co-hosted challenge with Will from WhereToWillie. Look for that on Tuesday! Other working titles for this blog include: ‘Editing, it’s a team sport”…or “A Rose by Any Other Name is still a two-part blog about editing”. Over the last 10 years or so, we have experienced two notable trends – photo revolution and photo evolution. The photo revolution has been characterized by a rapid and dramatic shift from slide and film based photography to digital capture. Naturally, this fundamental change in how we obtain an image has also affected the procedures and equipment involved in post processing. Obviously, darkroom techniques could not – in the literal sense – be applied to a digital image…and so, the need for a digital editing equivalent was born. A few weeks ago, I read an article that tried to differentiate between a photograph and what the author defined as digital art. The argument was that, when compared to traditional film processing, digital images are often heavily manipulated to the point that the term “photograph” no longer applies. To me, that seemed a bit extreme. Instead, it seems that today’s digital image capture necessitates a new class of editing standards, and the resulting pictures should be viewed as another step in the evolution of photography. The shift in image capture technology is unintentionally changing how we think about and define photographic art. There was a time when darkroom techniques such as dodging and burning became standard and accepted practice in the creation of a film print. One would not look at a Weston, Capa or Cartier–Bresson image and wonder what had been done to the print under a safelight. It would just be a photograph. Similarly, there are now standard and accepted practices for digital post-processing. It’s rare for an image to go straight from camera sensor to publication – generally, there are at least adjustments to curves, levels, and some sharpening. Just like anything else in life, photography standards are changing to keep pace with technological growth and cultural shifts. Personally, I am comfortable embracing the new class of pictures while still respecting the roots of our craft. Art is an expression of self, and in the end, the manner of expression directly coincides with the artist’s individual boundaries. With that in mind, it seems that determining the degree of post-processing manipulations applied to any given image is a matter of working within the confines of your comfort zone. Or better yet, pushing the boundaries of what is creatively comfortable! Just recently, I tried another photo swap with my friend Will from www.wheretowillie.com. (For those of you on G+, think #HDRTennis.) After we swapped and processed, we discussed. 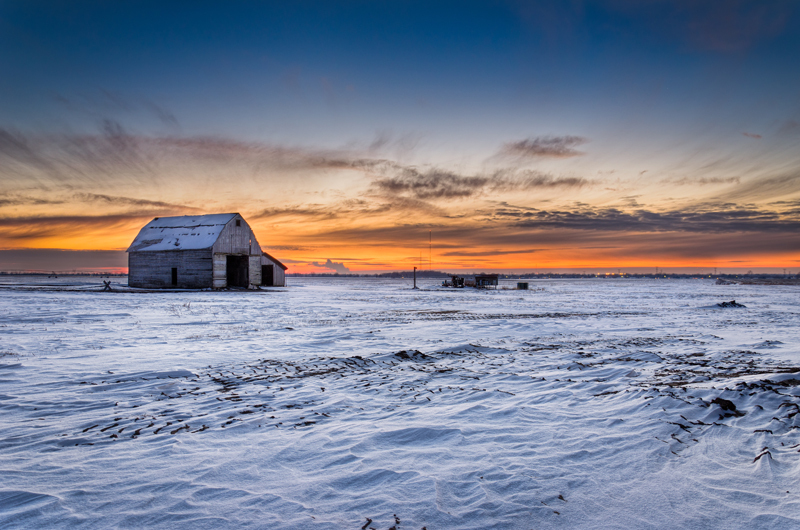 This image of a barn is one that Will took. To me, editing someone else’s image was an interesting experience, because I manipulated based on what I felt the scene *should* look like. The colors, for example…in my head, I thought about the way the sunlight *should* reflect off the snow. When I think of winter, I generally think of cold, blue tones. However, with such a vibrant sunset, it seemed that there should also be hints of red across the foreground. I eventually settled on two color masks with some areas having more red highlights than others. In particular, I left the corners of the frame with more blues to create a pseudo-vignette. Will’s thoughts: There is a sense that you seem to have about any given photo. You’re not only taking in the subject matter specifically and explicitly, but you are bringing your own self in to the viewing experience. 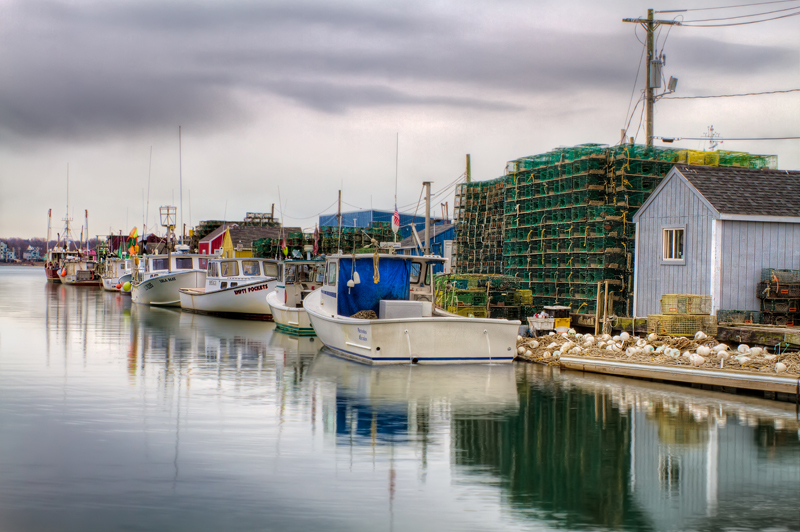 Although I’ve never been to Maine, I’ve seen boats, been to marinas, experienced the overcast skies reflecting off of a water’s surface. 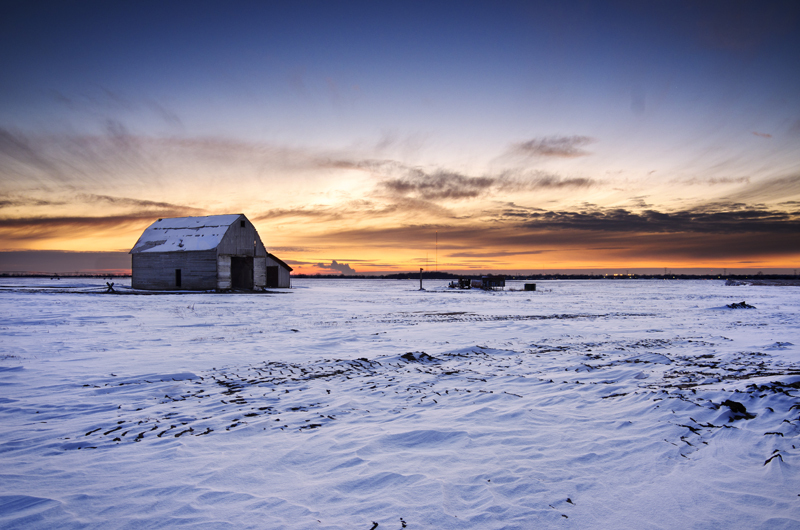 Although Shannon has never seen that particular Illinois barn, she’s emotionally experienced sunsets and snow, and taking from that has been able to capture a very similar feeling to her version of the photograph. The fact that two people can start with the same pieces of information (which at the end of the day, is all that digital photography is), and come up with similar yet different images is a testament to the intricacies that still live in photography. Although we play in a digital darkroom, our lives happen outside, where experiences bring together any person willing to open their eyes to situation. Another benefit to editing swaps is that it has been a clear way to identify my own weaknesses through discussion (25%) and comparisons (75%). 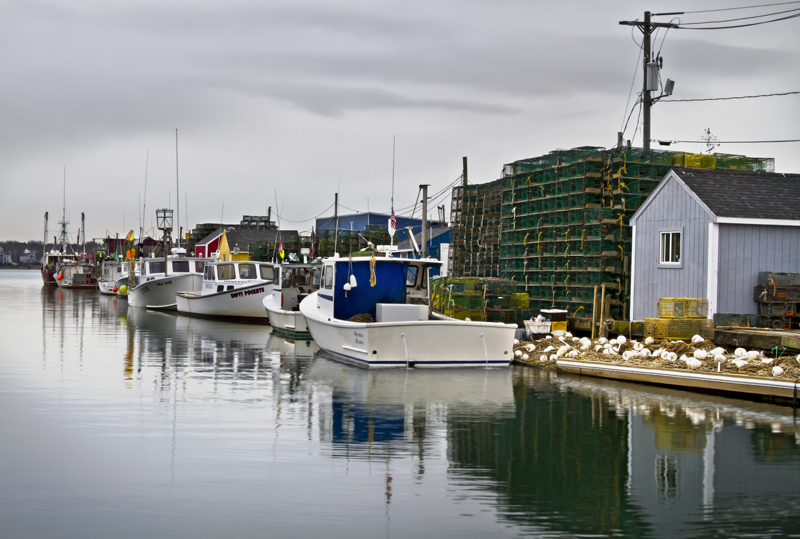 For example, mid-way through processing this photo of boats in Portland, ME we did a reveal. When I sat Will’s version (primarily HDR) next to my own (at that point, solely layered and masked exposures), it was easy to see that his unfinished edit had more noise than I cared for, and mine lacked detail in some areas of the boats. I wanted to find a balance between the two – less noise throughout, stronger detail in the highlights, softer edges around the edges closest to the water while maintaining detail through the traps and lines. Specifically, I wanted to find a good sharpening point for the lobster traps, in the event that someone wanted to print the image. Too much clarity in a print rarely suits me, but not enough sharpening and the image would seem to lack quality on today’s computer monitors. Will’s thoughts: Well this photo was pretty tricky for me. It had a wide range of subject matter, different textures and sensations that all melded into one rectangular area. As Shan said, we did a bit of a sneak peek, which really was me thinking I was done, but then going back and realizing that I could have done more. The image above was processed in HDR, then as I do for all my HDR’s brought into PS for bringing back parts of the originals that are more pleasing. I’m not always a zoom in to 200% and peep around the photo kind of person, maybe more likely to be looking at the grand scale view. The comparisons between photos and discussion of editing techniques really has helped me be able to realize where areas can be improved. If you have the chance, we definitely recommend it, and I’m sure will do more! Up until this point, I had never had creative editing control with someone else’s image. Comparing the two finished products led to a great discussion about our respective creative visions. Furthermore, the exercise helped me identify and improve editing weaknesses, and expand the boundaries of my editing comfort zone. See? Editing really can be a team sport!